I am blessed to be the Mom of 3 beautiful, successful daughters. Melissa is Mom to Sara and Matt. Colleen is Mom to April and Sophie. My youngest daughter, Tara, is a single New Yorker, currently in graduate school. I have 4 grandchildren: Sara is 18, Matt is 14, April is 14 (cousins Matt and April were born 3 months apart - a very busy, exciting time) and our little Sophie, who is 11. Kind of a funny story goes with what they all call me; I am "Burr". When Sara was a baby, before she could talk, she would make a "burring" noise in her throat, almost like a kitten purring, whenever she would want me. Once she could enunciate words, she insisted that I was Burr. When the rest of the grandkids came along, they followed suit, and I remain Burr (their friends call me Burr too :0). My great nieces and nephew call me "Graunty Dot". I have been on an elated high for over 19 years upon hearing I would be a grandma. I wanted my daughters to experience the same sense of purpose and fulfillment I felt in being a mom to them. My biggest concern was how much times had changed between the 1970's when they were born and the late 1990's - 2000's when they were becoming moms. I had the wonderful luxury of being a stay at home mom, nursing my babies and doting exclusively on them. My married daughters, both successful career women (one a corporate VP and one a pharmacist) had to juggle motherhood with careers. Fortunately, my husband and I both worked at jobs where we could flex our time and be on hand for day care when the grandkids were babies. One of the best parts of being a grandma is watching my daughters become such wonderful moms. I love seeing the values that are being instilled in this next generation of our family and feeling optimistic about the future. The most challenging part for me is reminding myself that these are my grandkids and not my kids. Their parents make the rules and we, as grandparents, must completely support them. I also have a difficult time with not over indulging them. I raised my daughters as a single Mom for most of their childhood (I married their very, very doting step dad when they were tweens) and there was very little discretionary income for fun things. Now I find myself wanting to do for the grands all the things I could not afford to do for my daughters. Our little Sophie is a veritable wellspring of laugh out loud moments. She has always had a very unique way with words and a unique way of looking at things. Recently, she was describing to me an in school project she was working on. She told me how much fun it was to use "that internet search thing where you have to turn the pages." "You mean an encyclopedia?" I asked. "Yeah, I think that's what they called it" she replied. When the grandkids were little and my husband was doing most of the daycare, he turned our house into a kids craft paradise. He did not believe in using tv or any electronics to entertain he kids. I would come home from work to find my garage floor covered in brown paper and toddlers in their diapers happily using their chubby little bodies as paint brushes (I still have the collage). There were always puzzles, games, finger paint projects, bubble painting, and outings to jumping gyms. I think he missed his calling and should have been a teacher instead of a firefighter. Now that the kids are older, football in the backyard is a frequent activity. The girls love to cook and bake. Grandpa has all of the kids playing backgammon and Scrabble is also a favorite. We are all very big readers in our family, so book discussions are a frequent activity. Because we live so close (all within 1/2 mile of each other) activities when visiting at their homes are pretty much the same as when they are visiting us. Our most elaborate vacation was a family trip to Turks and Caicos for our 25th wedding anniversary in 2012. 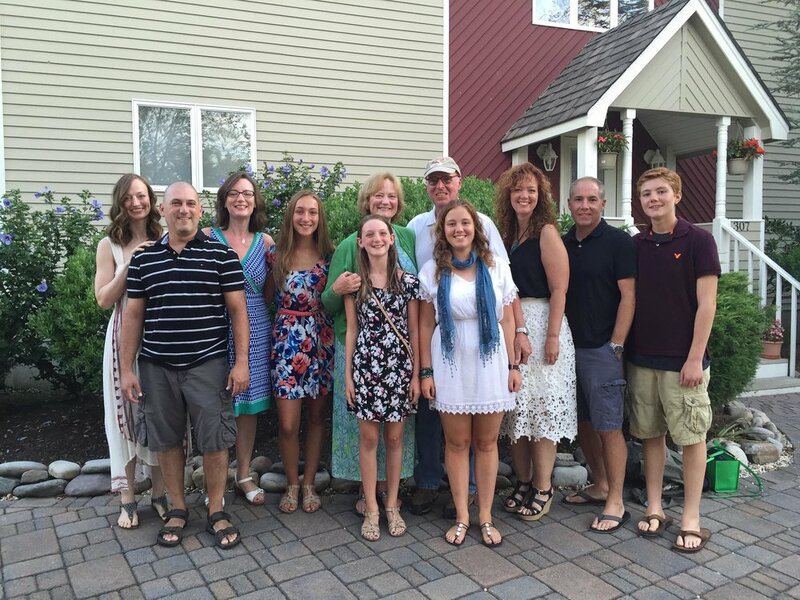 We brought the entire family, our 2 oldest daughters, their spouses and the 4 grandkids. (Our youngest daughter was unable to make it due to school obligations). However, I think the most rewarding vacations are our annual family vacations to Long Beach Island on the New Jersey shore. We have been renting a large house every August for the past 17 years and the entire family gets to be together, relax and enjoy each other. The cousins are all very close and love being together. The key to a successful, stress free week with that many people in one house is to have a house large enough for everyone to have their own personal space. It took some searching, but we found a 6 bedroom, 4 bath home with a pool and only a block from the beach. No expectations or obligations are placed on anyone - everyone is free to spend as much or as little time together as they wish. Recipe must work because it is the talked about highlight of everyone's year. Because we see our grandchildren almost daily, maintaining bonds is not difficult. My husband (Pop Pop) drives Matt home from school every day. Matt spends afternoons at our house doing homework until it is time for Pop Pop to drive him to one of his sports practices (swim team and football). Eighteen-year-old Sara is now driving herself, but she and I have a weekly standing dinner date, just the two of us, to connect. We both love ethnic cooking and search out all the local eateries. She is her high school newspaper editor and publishes a book review column, so she likes to bounce ideas off of me and discuss what we are both reading. She is infinitely interested in what it was like to grow up in the 60's at the start of the women's movement, affirmative action, and the politics of the day. My past, somewhat hippie life, is very interesting to her. I was something go a hippie chick in the 60's, loving to attend rock concerts. Many of our rock idols of the day are still touring. We have taken Sara to several. One happy memory was watching this 2015 version of my teenage self dancing in the aisles at a New York City John Fogarty (Creedence Clearwater Revival) concert to the tune of Fortunate Son :0). We have April and Sophie stay with us every other weekend when their parents work schedules overlap (they are both pharmacists). Also, all 4 grandkids are very involved in sports. Pop Pop and I rotate through the kids, sitting ringside every weekend at either a swim meet, football game, field hockey game, basketball game, track meet, or tennis match. One family tradition we started several years ago as the kids were getting older, was to replace birthday and holiday gifts with experiences. Instead of a gift, we take the birthday child out for an adventure. We have done everything from Broadway shows and dinners, New York Car shows, weekends in Gettysburg, touring the battlefield park, weekends in indoor water parks, etc. This past autumn the kids came up with the idea of a group birthday outing to the National Aquarium and the Baltimore Seaport. We spent 3 days touring the area and seeing all the sights, but I think the thing the kids loved best was having a great big pajama party in the hotel room at night. The four are all very close friends and truly enjoy each others company. When I think about what I most want my grandchildren to learn from me is the same set of values my parents instilled in me: Hard work always pays off, honesty in all things, giving back to community, commitment to family, unconditional love. One thing I wish I recognized earlier as a grandparent is to put aside the worries. As the years go by and I see the fine young people they are developing into, I know that my early concerns and worries were pretty baseless. Each day needs to be enjoyed fully as it occurs. Time passes very quickly - don't waste it with worries or regrets. New grandmas - enjoy this most amazing time in your life. It is truly the reward for living to a mature age. Enjoy each day as it happens and store up those memories. I call it "layering", making the most of each moment with your grandchild, so that after 18 years (and more) have gone by, you have built up a treasure trove of memories to reflect on and cherish. Eighteen-plus years as a grandma has caused me to think a lot about my own grandmother. She was my rock, growing up, the lady that I knew, no matter what, loved me unconditionally. My Mom was the same sort of grandma to my kids and great grandma to my grandkids. My grandkids were so close to her, that at her funeral back in 2010, my then, only 11 year old granddaughter, insisted on giving the eulogy. She spoke eloquently and from the heart. My grandmother and my mother live on in the hearts and minds of this next generation. 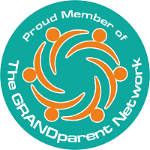 It is a legacy we, as grandparents, are privileged to pass on.